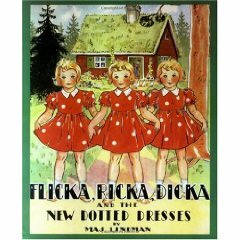 From Overstock.com, a dress that I'm on the fence about. On the plus side, really cute print; waistband; full skirt. On the minus, linen-rayon mix with actetate lining; the armholes look revealingly deep; that particular headless mannequin gives me the creeps somehow (maybe because the tight neck cords makes me think it's straining to find its head! ); won't that print be way over by next summer? 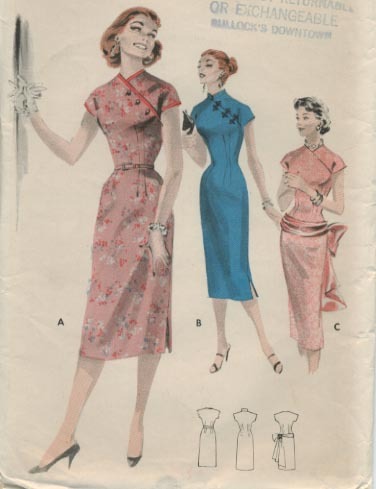 Added to the list of things I might, someday, perhaps, when I get around to it, sew: this dress (or one very much like it, considering I don't own this pattern and instead googled for something to use as an example of the kind of thing I'm talking about.) Click on the image to go to the site, sensibility.com, which has a lot of lovely pattern images. Anyway, you might ask, what brought this on? I bought a couple yards of grass green cotton satin fabric yesterday, that's what, down at Paron's on 40th St. They often have bolt-ends that they sell at $2/yard, and I am constitutionally incapable of passing up $2/yard fabric. I'm also invariably drawn to grass green, so my owning this fabric was more or less foreordained. I don't like to spend a lot on cotton satin, because it shows every little spot and I'm the kind of person who gestures wildly with a fork to make some Very Important Point about something or other and spatters myself with salad dressing. So there are a lot of little spots to show. This stuff is niiiiiice (it's leftovers from a Chaiken collection) and I was thinking (since I didn't have a enough for a circle skirt, more's the pity) that it would make up well as a chinoiserie-ish dress with (probably) pink satin collar piping. The only downside of a dress like this one is NO POCKETS. The first person to solve this issue for me will receive the Dress A Day Pocket Prize for Service to Humanity. Never mind that I, personally, would look like I was in (bad, fraternity-pledge-hazing) drag if I wore this — the excellence of this as an objet d'art trumps any petty concerns of mere suitability for my phenotype. And this dress has the added thrill of being a realio-trulio mystery dress! Yes, the Drexel University Historic Costume Collection (click on the image to go there) is looking for help in sourcing this dress. Do you know who the designer is? Email them. Tell them A Dress a Day sent you. They'll have no idea what that means, but it sounds good. Unless your personal aesthetic demands that you look like a large, slightly discolored and inexplicably gift-wrapped eggplant, I don't think this 1932 Augusta Bernard dress quite lives up to the standard of elegance that one expects from a 1930s evening gown. It's good to remember that "vintage" doesn't automatically equal "pretty." Check out this dress with the tucks sewn all around the skirt AND on the bodice front. This is hours and hours of tricky, tricky sewing, not to mention that it would really, I think, have to be made in silk organza, which is pricey (the pattern alone is $45!). But — doesn't it look worth it?